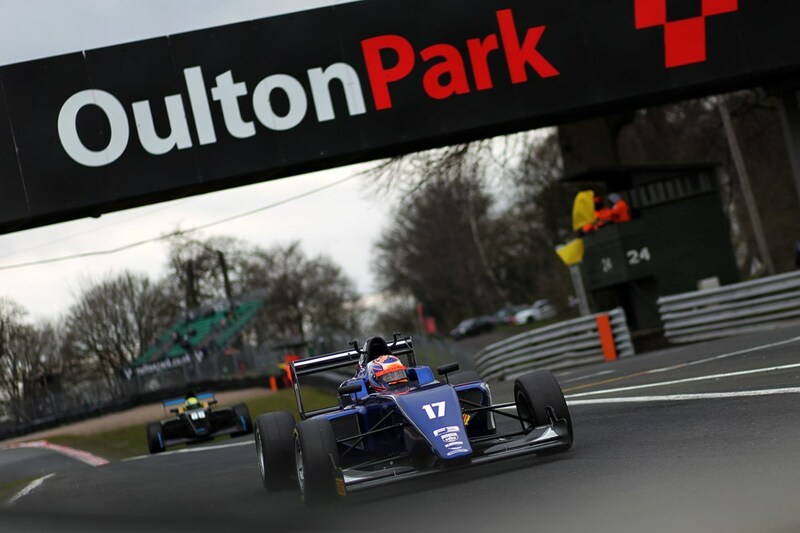 The 2018 BRDC season roared into action at Oulton Park with damp qualifying in the morning, an action packed race in the afternoon and one incredible teenager. With hardly time to douse our hangovers or question last night’s choices, the British F3 desk was up early for qualifying and race one in the opening round of the season at Oulton Park. Qualifying started in damp conditions, but that didn’t stop Carlin Racing’s Clement Novalak as the Brit put in a late flier to claim pole. Novalak was just over a tenth of a second clear of Double R Racing’s Linus Lundqvist, with Novalak’s team mate and testing hot-shot Nicolai Kjaergaard third. Krish Mahadik claimed fourth for Double R Racing, just 0.009 seconds ahead of Billy Monger, taking part in his first qualifying session since his life-changing F4 accident last year, and just over half a second away from the overall pace. To say fifth was an amazing achievement would be an understatement. Here at Overtake Towers we were scared to drive in the snow, making Monger’s achievement more incredible. Fortec’s Tom Gamble claimed sixth, 0.013 seconds off Monger, with Hillspeed’s Sasakorn Chaimongkol putting in a late effort to surge to seventh. Sun Yue Yang, Jordan Cane and Kush Maini completed a top-10 separated by less than nine-tenths of a second. On to the afternoon and race one. Let’s not forget that for 2018 race two has a complete grid reversal so all eyes were on how teams would play it in the opening race. It didn’t disappoint. Pole-sitter Novalak got plenty of wheel spin in the damp conditions at the start, and was passed on the run down to Old Hall on lap one by fellow front-row starter Lundqvist and by team mate and season favorite Kjaergaard. Holding third midway round the lap, contact between Novalak and Mahadik resulted in Novalak retiring on the spot, delaying Mahadik, and promoting Monger up to third. The safety car got its first airing, and racing resumed at the end of lap three. Lundqvist made a great restart to stretch a margin over Kjaergaard over the line, maintaining a half second advantage for several laps before Kjaergaard began to apply pressure in the closing stages. On lap seven, Lundqvist’s lead was down to 0.346 seconds, and a lap later the pair were nose-to-rear wing crossing the line. Displaying strong defensive skills and not allowing his rival any chance to overtake, Lundqvist was then able to stretch his advantage slightly on the penultimate lap, and ultimately claimed the win, his first in this formula by 0.826 seconds, becoming the early championship leader in the process. Kjaergaard’s second place was his first podium result in British F3 too. Behind Lundqvist and Kjaergaard, there was a dream return to racing for Monger, with a podium finish on his British F3 debut. He started fifth, kept his nose clean on the opening lap and then avoided the clash between Mahadik and Novalak to climb to third. Although at tad off the pace and unable to quite match Lundqvist and Kjaergaard, the Brit, making his race return after almost a year spent recuperating from his accident was never seriously threatened, with Gamble in fourth not quite able to put him under any kind of pressure. Monger held a second advantage over his nearest rival for the majority of the race, and when Gamble did reduce the margin, Monger was quickly able to restore his advantage despite a slightly messy final lap. Monger received a hero’s reception on the podium after the race – quite rightly – with the 18-year-old walking onto the podium to collect his trophy. I don’t think sponsorship for the rest of the season will be hard to come by… Hell, I’LL give it to him myself! Fourth for Fortec, Gamble had a solid start to his single-seater career after doing well with Ginetta last year while Mahadik recovered from the first lap trouble to claim a strong fifth for Double R Racing. Sun Yue Yang’s sixth was a strong showing for Carlin, with Douglas Motorsport’s duo Jordan Cane seventh and Jamie Chadwick eighth, gaining four places compared to her starting position after a fighting drive. Kush Maini’s ninth for Lanan showed plenty of pace, lapping on the same pace as the leaders, while Sasakorn Chaimongol backed up his strong qualifying with a top-10 finish for Hillspeed.